The researchers behind this innovation intend it to be used as a new form of security, in which the lasers emitted form unique identifiers for the people or things onto which they are transferred. The product is definitely an interesting step towards more powerful wearables or gadgets. Lasers are viewed as complex or high-tech tools, in the hands of scientists or astronomers. But, it is true that the development of these devices from conceptualization to reality may have been considerably convoluted and time-consuming. However, in truth, lasers ultimately consist of some essential components: an initial light source, a focus for this light and a medium through which the actual laser (a highly-focused beam of light of high-energy) can be beamed outwards. The focus may be a specially-constructed chamber, shaped in such a way that all the source-light bounces off it and strikes the medium (a crystal like a prism) at right angles, simultaneously. Some laser chambers are very big and composed of materials such as gold. 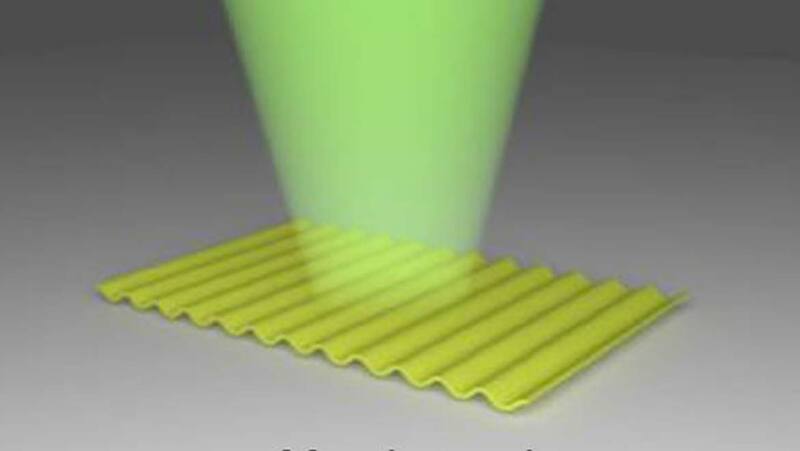 However, in theory, lasers can also be produced by specific materials in layers as thin as 200 nanometers (nm). Many modern lasers are made out of other materials that are much bulkier and require a greater surface area to function properly. Therefore, a team of researchers from the Organic Semiconductor Center at the University of St. Andrews in Scotland set out to develop a solid-state laser that could be brought down to this minimum possible size. The results were classed among an emerging technology called organic lasers with distributed feedback (DFB). These laser types can gather ambient light from their surroundings as a source, and 'bounce' it around within their molecular structures to emit light of the desired wavelength and pulse-rate (from which the term DFB was derived). Thus, getting the organic materials in question to emit laser beams was not such a big problem for the team, after all. But, converting them into ultra-thin membranes was an issue they faced. 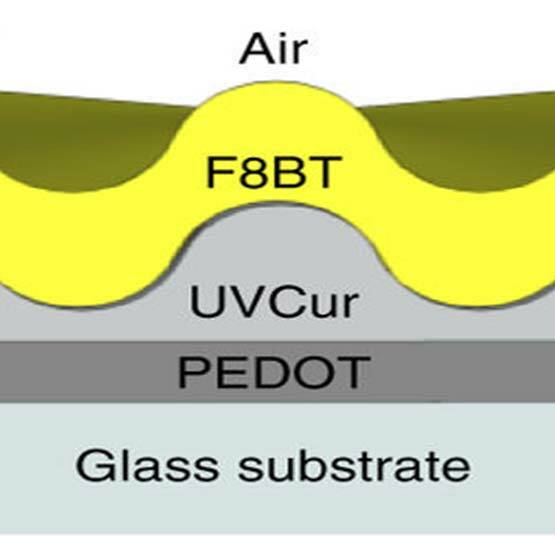 The scientists solved this problem by employing the technique of nano-UV lithography, which uses UV light to 'etch' the materials into the desired conformation. The laser itself consisted of a UV-curable material, which afforded DFB, and a light-absorbing polymer called F8BT. This polymer, which is also a semiconductor, supplied light to the DFB via the property of photoluminescence quantum yield (PLQY). These two layers, with the DFB layer on the bottom, were overlaid onto a final polymer layer that, in turn, sat on a layer of glass. This sandwich was then immersed in water, which caused the bottom-most polymer layer to dissolve and the rest of the 'sandwich' to float upwards away from the glass. It freed the complete laser from the need to rest on the glass. The obviation of the glass also increased the laser's refractive index from about 1.5 to 1.7. The stand-alone nanometric lasers assumed a series of tiny, interlocking curves in both layers (known as the diffraction grating), which were necessary for DFB. Finally, the lasers became flexible and could be transferred onto other surfaces while retaining their desirable attributes. The researchers reported that neither the production process nor the resulting flexibility affected the PLQY of the F8BT layer. The thin-layer lasers exhibited the ability to emit light at an excitation wavelength of 450 nm in 5 nm pulses. These figures were associated with a source-light threshold of 3.3 kilowatts per square centimeter. The team noted that the results related to laser performance were comparable to those associated with other high-tech DFB-type lasers available today. The source threshold was also reportedly impressive compared to those of other similar polymers that perform in the same manner. Examples of these include 'Super Yellow' and other formulations of F8BT. In addition, these polymers have not yet been involved in the production of such thin, flexible lasers. The researchers applied their new lasers to banknotes and also to a contact lens mounted on a bovine eye. They demonstrated that this resulted in clear, appreciable laser feedback quantifiable with conventional spectroscopy. The group of investigators also asserted that their lasers could be tuned to emit a range of unique wavelength signatures (in numbers as high as 10^15) through minute alterations to the diffraction grating. Therefore, these new lasers could have a multitude of applications in the security, authentication and surveillance industries. A team of material scientists from St. Andrew's in Scotland have developed an innovative nano-polymer membrane that also acts as a DFB laser when exposed to light. These new lasers were designed to be thin so as to be integrated into flexible contacts as well as many other surfaces, including next-generation banknotes or IDs. Therefore, the breakthrough may enhance the security and authentication processes of the future. On the other hand, they are not high-intensity eye lasers. M. Karl, et al. (2018) Flexible and ultra-lightweight polymer membrane lasers. Nature Communications. 9:(1). pp.1525. J. Herrnsdorf, et al. 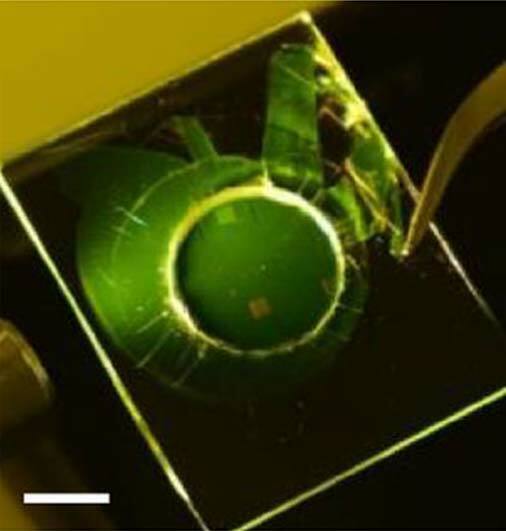 (2010) Flexible blue-emitting encapsulated organic semiconductor DFB laser. Opt Express. 18:(25). pp.25535-25545. A. J. Kuehne, et al. (2016) Organic Lasers: Recent Developments on Materials, Device Geometries, and Fabrication Techniques. Chem Rev. 116:(21). pp.12823-12864.